The stork is coming and it’s time to celebrate! 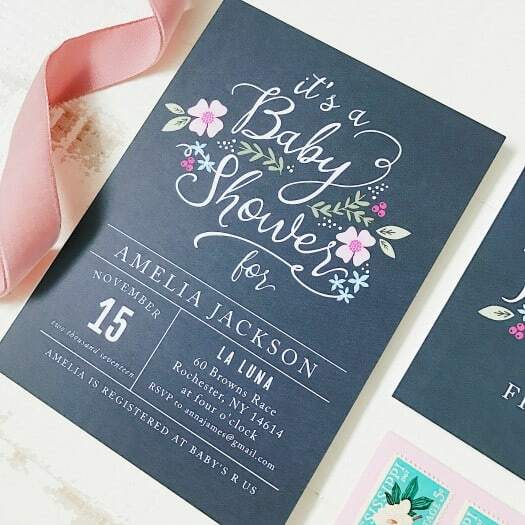 Everybody loves baby showers but the cost can be staggering as anyone who has ever planned a baby shower knows. Whether it’s for your friend, a relative or neighbor, you, of course, want to make this baby shower the happiest and best as possible. It should also be stress-free but how can it be when you’re thinking of it to fit on your budget. 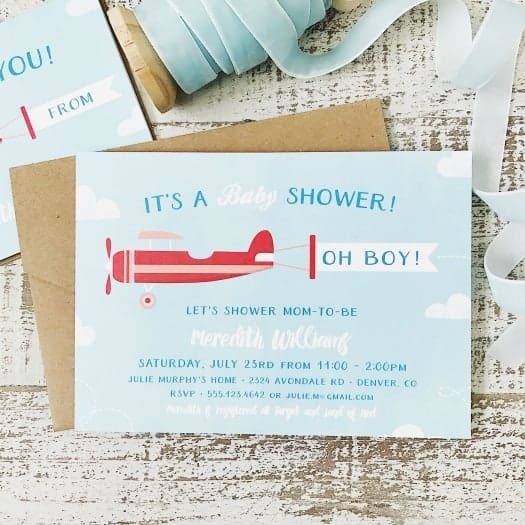 It isn’t that the guests expect a large bash but we want to host a memorable baby shower that the expectant parents and that the guests will feel comfortable and will surely have a great time. It’s a day of celebration for the coming baby, you want it to be a success so to help you out plan that awesome party I want to share with you some of my tips on how to plan a baby shower on a budget. 1. Select a theme that allows you to add your own DIY touches without the need to buy a lot of things. You can create your own centerpieces, banners, decors, photo props, party favors and even game prizes such as homemade body scrubs or homemade lip balms. 2. Purchase tablecloths, plasticware, plates, napkins, and cups at the Dollar Store. 3. Set a specific time on how long the party will last. That way, you know you won’t run out of food to serve or activities to do. 4. Food is an expensive must-have for the party. Plan your shower for mid-afternoon, guests will have already eaten lunch and you can go with lite foods. Prepare a buffet set-up. It will cost less than serving each. You can also ask close friends to help you out bake some cupcakes or treats. You can also set up your sides before your main dishes. Guest will fill up their plates with the less expensive items and take less of the entree. 5. Take people up on their offer to help. You do not have to be a superwoman and do everything yourself. Remember when planning a baby shower that 5 people bringing dishes is 5 less dishes you have have to make or pay for. 6. As an activity or a game, you can let guests make something that will serve as a token and a memorable gift for the new parents and their coming baby. I went to this baby shower before where they had this photo from the maternity shoot on a frame with a space around and they asked everyone to write their wishes on it. 7. Invite friends and family in style without spending a lot. 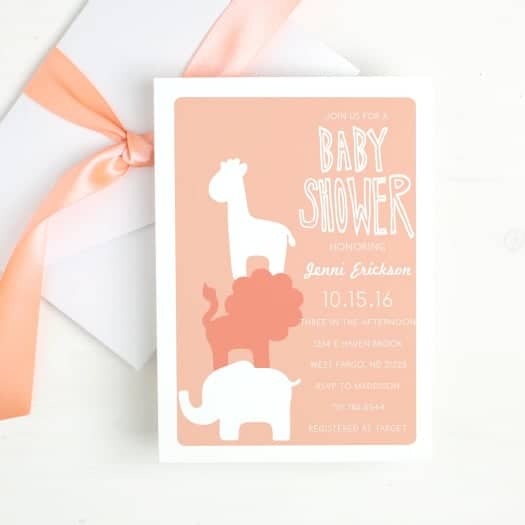 Be wise and save on baby shower invitations by using a coupon. Right now, Basic Invite is offering 15% off with coupon code: 15FF51. 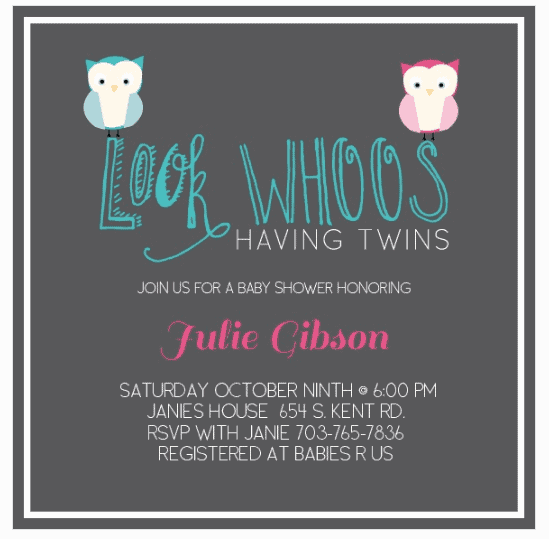 If you’re preparing for baby shower for expectant mom-to-be of twins then Basic Invite has some super adorable twin baby shower invitations like this “Look Whoos Having Twins” baby shower invitations. If you’re still looking for a great theme for the party that you’re planning then why don’t you prepare an owl themed baby shower. They’re cute and fun. 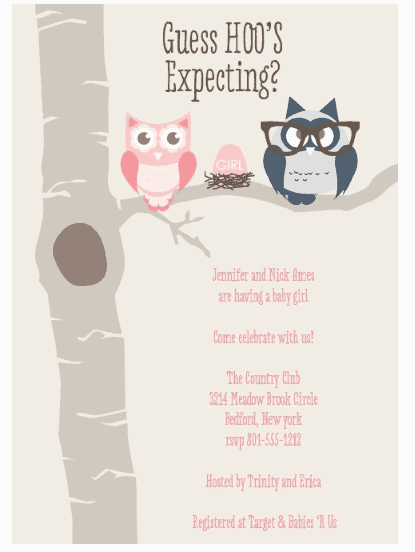 Basic Invite has a collection of super cute owl themed baby shower invitations. What I love about Basic Invite is that they have almost unlimited colors to fit perfectly with your party theme. Once you select a design you can change the color of each element on the card to over 180 different color options with instant previews online so you can make sure the card is exactly how you want it down to the littlest detail. This is what sets them apart from almost any other online stationery company. You can also choose from over 40 different colors of peel and seal envelopes. 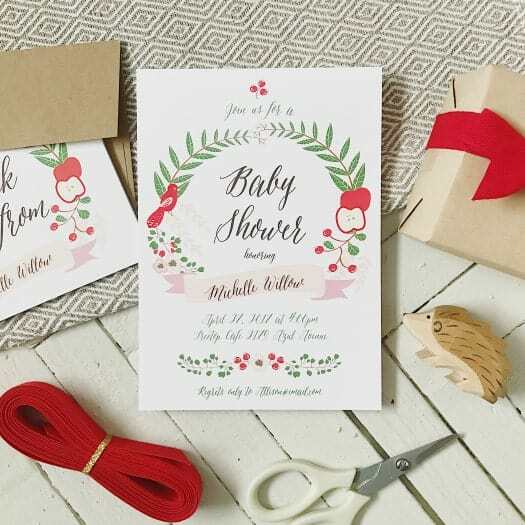 Another great feature that they have is the ability to order a printed sample of the actual invitation so you can see exactly how it will print as well as the paper quality before they ever have to place their final order. They also have foil cards in gold, silver, and rose gold. Customers can choose flat or raised foil on all of Basic Invite’s foil designs. 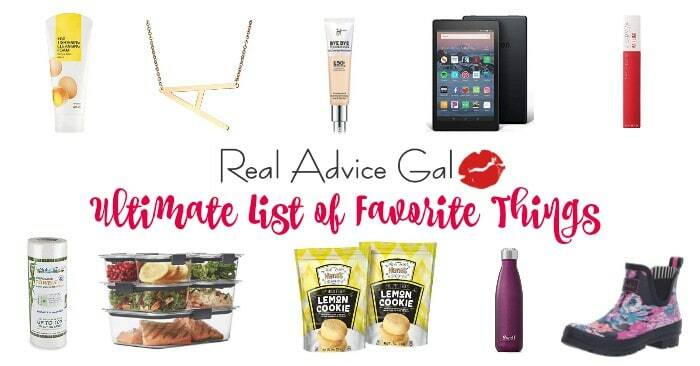 I highly suggest you check out Basic Invite now and take advantage of the 15% off with coupon code: 15FF51. Also visit Basic Invite on Facebook, Pinterest, Twitter and Instagram to see their latest designs and promos. Water Bottle Craft: New Baby Edition!